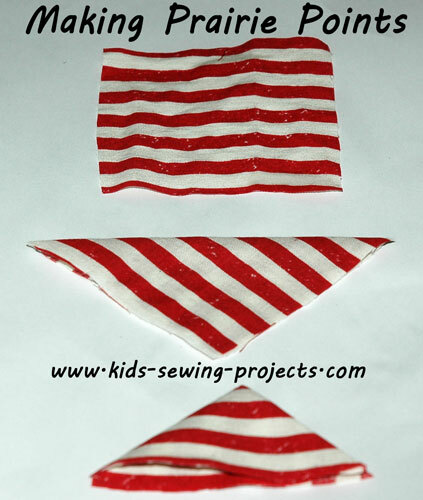 On this page are directions on how to create prairie points to decorate your sewing projects. Prairie points could be added to the edge of quilts or blankets. We've added them to a cloth basket you'll see below. Use your imagination for adding them to finish off many different sewing projects. Fold your square fabric in half making a triangle. Iron flat. Turn again to make a smaller triangle. Iron flat again. To add to your project pin to edge and sew over the top of each point. 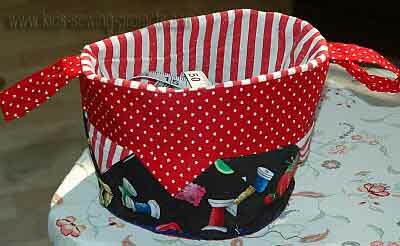 You can add these around the outside of quilts, cloth baskets, pillowcases, pillows, whatever you can imagine. For these projects you would sew the prairie points as shown above. For example, to add to a pillow you would sew points to one of your rectangles or squares of material and then sew the two right sides together. Once you turn your project right side out your points will be showing. Here is another example of what you can do with prairie points. On to more projects from sewing prairie points.